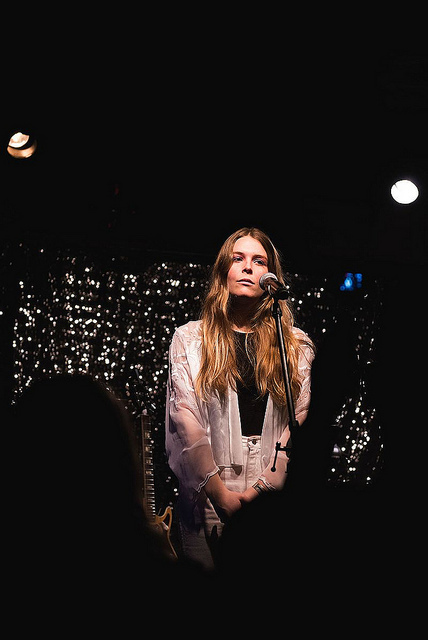 Musician and singer-songwriter Maggie Rogers rose to almost overnight success after Pharrell Williams heard her song “Alaska.” Rogers released her first record on Jan. 18. Courtesy of Wikipedia. It’s every college student’s dream: attend a networking opportunity on campus, meet an icon in your field of interest and impress them so much that they snap you up into a cloud of lifelong success. Needless to say, that is not the way life usually goes. But for Maggie Rogers, it was. In 2016, Rogers was studying at New York University’s Clive Davis Institute of Recorded Music when she was invited to attend a music masterclass hosted by both her Grammy-winning professor Robert Power and an anonymous industry expert, who turned out to be Pharrell Williams. He had dropped in to listen to students’ songs and offer feedback. Upon hearing Rogers’ track “Alaska,” written only eight days earlier, Williams unleashed a five-minute-long soliloquy which was equal parts glowing review and ode to musical individuality. Beginning with “I have zero, zero, zero notes for that,” the artist went on to make comparisons between Rogers’ music and everything from the Wu-Tang Clan to Reese’s Peanut Butter Cups (YouTube, iamOTHER, “Pharrell Williams Masterclass with Students at NYU Clive Davis Institute,” March 21, 2016). Even more remarkable, however, is the ease with which Rogers mixes the audible aspects described above with emotional and relatable coming-of-age lyrics. The collection listens almost like a musical bildungsroman, tracking Rogers on her journey from dramatic adolescent moments in which she recalls, “I remember way back/Late night, throwback/Sitting on the front lawn when I lost it,” to deeply reflective, self-exploratory experiences like, “Moving slowly through westward water/Over glacial planes/And walked off you/And walked off an old me.” This verse seems to describe shedding the youthful, reactionary version of Rogers who would have “lost it” in tense moments. Within only the context of that first conversation back at NYU, it is not difficult to understand why Rogers’ music rings powerfully personal and resonant. She talked about how she grew up playing folk-banjo music in rural Maryland and moved to New York City to continue down that path. Rogers added, “I stopped making music for a couple years in the middle of school and just went through some things and developed and learned some more about myself and I studied abroad in France and had a really spiritual experience with dance music there” (“Pharrell Williams Masterclass”). She went on to say, “I just started making music again a couple months ago and I can’t make enough.” This seems to echo a quintessential facet of many truly great artists’ work: The most heightened moments of creativity coincide with the greatest growth periods in life. It makes sense, then, that armed with the tools of newly-discovered personal clarity and stylistic vision, Rogers is able to produce truly exceptional art. These elements shine perhaps most brightly on the record’s ninth track, “Fallingwater.” Rogers sings, “Hold on, I thought that I could take it from here/Oh, I thought that I was coming clear/Now it’s getting harder.” This serves to remind the listener about the ups and downs of self-discovery and development—she is telling her own story and refusing to stop or care if anyone relates, which inherently renders her message profoundly relatable. Rogers serves as a reminder that even people who stumble upon almost overnight success face challenges and uncertainty; not everything in life becomes clear even after one achieves the college student dream.